Heat the oil in a large saucepan over a medium heat, add the onion and fry until soft. Add the beans, potato and stock, bring to the boil then reduce the heat and simmer gently, uncovered, for 20 minutes, or until the potato is tender. Add the pesto, stir well, then liquidise the soup in a blender. Season to taste and reheat gently. To garnish, thin a little pesto down with some olive oil and drizzle on to the soup. 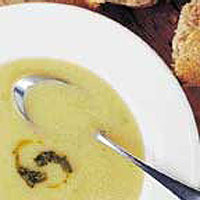 This recipe was first published in Sat Jan 01 00:00:00 GMT 2005.